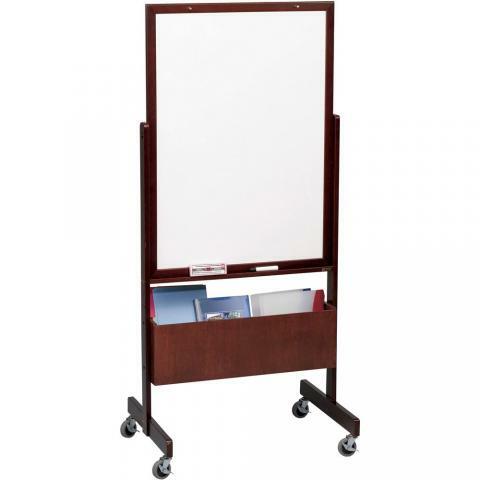 Double Sided Movable Whiteboard! This whiteboard is constructed of PVC Coated Steel whiteboard surface. The magnetic whiteboard also doubles as a magnetic bulletin board. The double sided whiteboard is mounted on a height adjustable easel, which rolls on 3" locking casters. Accessory trays and flip chart hooks are mounted on both sides. An accessory storage bin is mounted on the bottom. 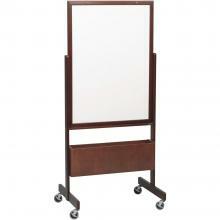 The design of the movable base allows multiple units to be nested together for compact storage.